U 9.592-7 In the daylit corridor he [Lyster] talked with voluble pains of zeal [...] A patient silhouette waited, listening. U 9.1110-6: Stephen, greeting, then all amort, followed a lubber jester, a wellkempt head, newbarbered, out of the vaulted cell into a shattering daylight of no thought. [...] In the readers' book Cashel Boyle O'Connor Fitzmaurice Tisdall Farrell parafes his polysyllables. 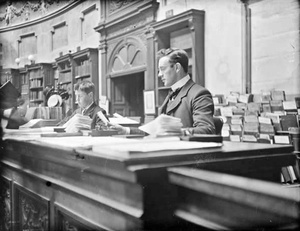 Most readers of Ulysses familiar with the layout of the National Library in Kildare Street assume that Stephen Dedalus and the other characters visiting the Librarian’s office entered and left it through the door leading into the reading room from behind the counter (see image). A short sentence in an article about Joyce and the National Library by Padraic Colum suggests that we need to review the situation. Colum belonged to the literary circle around George Russell, one of the participants in the Scylla and Charybdis episode, and is mentioned as a promising young poet there (9.301-305). The librarians had their offices along a corridor one entered from behind the counter. — There’s a gentleman here, sir, the attendant said, coming forward and offering a card. From the Freeman. He wants to see the files of the Kilkenny People for last year. — Is he? ...... O, there! As this floor plan unmistakably shows, no corridor was involved when one left the Librarian’s office through the door that led directly into the reading room. Furthermore, anyone standing under the glass dome of the reading room would not have been in silhouette, but bathed in light. Lyster (L) leaves his office by the side door to attend to Bloom (B) in the corridor and takes him to the provincial newspapers. Later Stephen (S) and Mulligan (M) leave through the gate in the counter, past Farrell (F) at the visitors' book and out through the exit turnstile (dot). The entrance turnstile, described as "clicking" in Portrait because it had a counting mechanism, can be spotted in the black-and-white photograph linked above. So it becomes obvious that the door which closes behind Lyster in this scene is the one that leads into the book corridor, where a waiting Bloom would indeed have presented a silhouette against the window and would have remained a shadowy figure following Lyster to the provincial papers. (View from the librarian's room. When Mulligan and Stephen, however, leave the Librarian's office later, they are met by "shattering daylight" (U 9.1111), which strongly suggests that Mulligan used the door that directly opens into the area behind the counter. 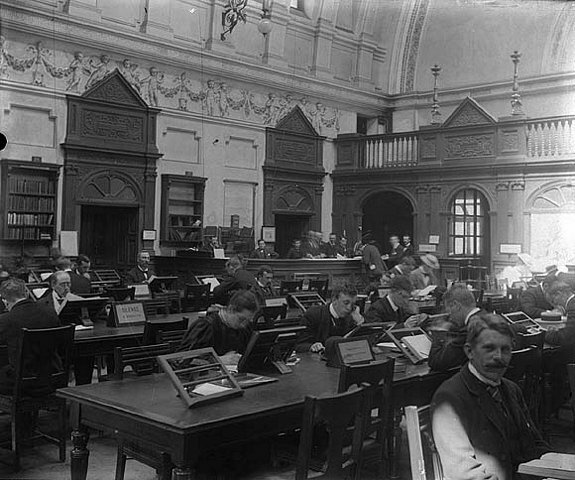 Contrary to the book corridor the readingroom would have been flooded by sunlight at this time of day. Passing through the flap in the counter on their way to the turnstile Stephen notices the lunatic Farrell writing his many names into the visitors' book laid out here (see image). Although there was a second librarian’s office this scene suggests that Lyster and Eglinton shared the office as Eglinton is the only person who remains seated at his desk throughout the episode. This would hardly have been the case had he just happened to be in Lyster’s office by chance. His desk lamp is on, but there is another desk that is unlit and for a few brief moments occupied by Mulligan. The two offices of the chief librarian and his assistants (Eglinton and Best normally were on different shifts) were next to each other and connected by a door in the partition wall between them - “eavesdropping” (U 9.574) because it did not reach the ceiling - as any visitor can still see today.